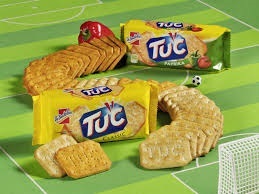 TUC is a brand of snack biscuit available in Europe, Asia, North America and North Africa. The salted savoury snack biscuits are octagonal in shape (like a rectangle with the corners cut off) and are golden yellow in colour. Pinprick holes (to prevent baking bubbles) spell out the name TUC. TUC crackers for Europe's English speaking markets are made by Jacob Fruitfield Food Group, part of the Valeo Foods Group, and they have a taste somewhat comparable to Ritz in the UK. In mainland Europe they are marketed by Mondelēz International.